Menton is such a quaint town. I can definitely see why artists were inspired by this delightful place. We stayed over at Claridges - well, Menton's answer to it, which was a fairly bog standard b&b along one of the principal roads through Menton. It seemed like a family run affair with all the goings on between the staff that reminded me of the cafe in that French film, Amelie (Le Fabuleux Destin d'Amelie Poulain). There was a young attractive laid back receptionist, and an older woman who appeared to get all stressed out and neurotic when the machines didn't work. There was a man who spoke like he smoked 80 cigarettes a day. I didn't notice anyone eyeballing me and taping my movements, or any strange goings on in the stock cupboard though! Anyway, the service was good and the rooms were neat enough. We walked along the main drag that had all the restaurants and shops, rue St Michel. We also walked along the coast, which looked really idyllic - even nicer than Nice. Dinner was at La Coupole, which I'd recommend as it was very French - so that meant good quality food. Alot of the other places were doing pizzas - probably to cater to the prominent Italian community. So we left Menton on Friday morning under the beautiful morning sunshine. We continued up the road our hotel was on to start the climb up towards the Col de Castillon. It was pretty easy to find. Our intention was to wend our way up to the mountain village of Sospel. The scenery changed from semi-urban to village like, then it became deserted and only the dramatic rocky mountains became our friends. Unfortunately the sky turned grim as dark clouds began to emerge. By the time we arrived at Castillon the atmosphere was seriously threatening as it looked like a heavy shower was imminent. Even though there were other cyclists still heading up the road towards Sospel we made the decision to turn back and return to Menton, as we did not fancy being stranded up at 1200m in what would probably have been snow. We were lucky, as the rain began to fall from about half way down the decent. Even there at 500m altitude it was snowing. I had to take alot of care on the switchbacks as I was on racing tyres and the bike was laden with panniers. So half an hour later we were back at Claridges in Menton. The reception staff made a lot of fuss about our return: the weather is normally lovely here, they said, what a shame you got wet etc., would you like to sit down and dry off, sorry there's no more breakfast but have a nice cup of coffee to warm you up. One of the guys there said he'd seen us on the road and was glad we'd made it back safely. When I told him we had been hoping to get to Olivetta San Michele across the border in Italy, he said we did the right thing not to go there. The roads are not brilliant on the Italian side, he said, not like on the French side. It's really narrow, poorly maintained, loads of gravel and you would definitely have got a puncture. No, you're better off staying on the French side! Once we'd dried off we made our way into Italy on the low road, following the coast line. After about 8 miles we were in Ventimiglia and got there just in time to catch the municipal market. Great place for bargains - clothes, food, household items etc. We figured we wouldn't really need pots, pans or picture frames though, so we just stuck to getting a nice salami tramezzini. Ventimiglia does not get a good press as many people just pass through the part of the town near the main road. True, that's nothing to write home about. 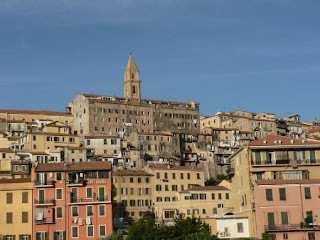 But the old town of Ventimiglia Alta is very quaint, and definitely worth stopping at if you have the time. Sadly, we didn't have the time, so just admired it from the distance before pressing on towards Bordighera, Ospedaletti, San Remo, Taggia, Badalucco and our final destination, Molini di Triora. We were glad see to our friends, Jo and Ady - it had been a long day, what with the hills and the wind we'd had to contend with along the coast. But it was worth it and we'd seen some amazing views. I'm going to spend a week in Menton this August. Do you know any itineraries for day trips in that area? Do you know any biking day trips?